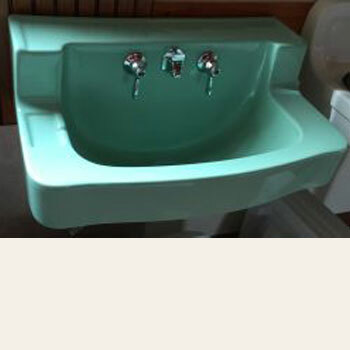 1951 Briggs fully restored Wall Hung sink. 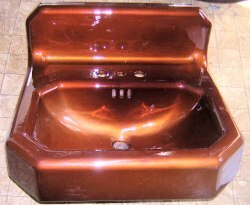 This is a cool old sink. The color is very close to Standard’s Ming green, but is not the same shade. The faucet is fully restored and this sink is ready to bolt to the wall. It measures 22″ wide by 13 3/4″ front to back. 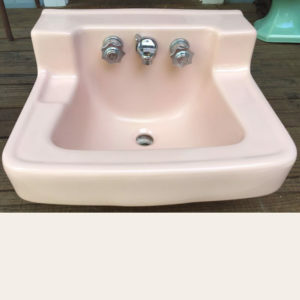 The only condition issue is a factory “pit” in the finish on the top ledge of the sink. There’s nothing we can do about this, it’s been there since 1951.